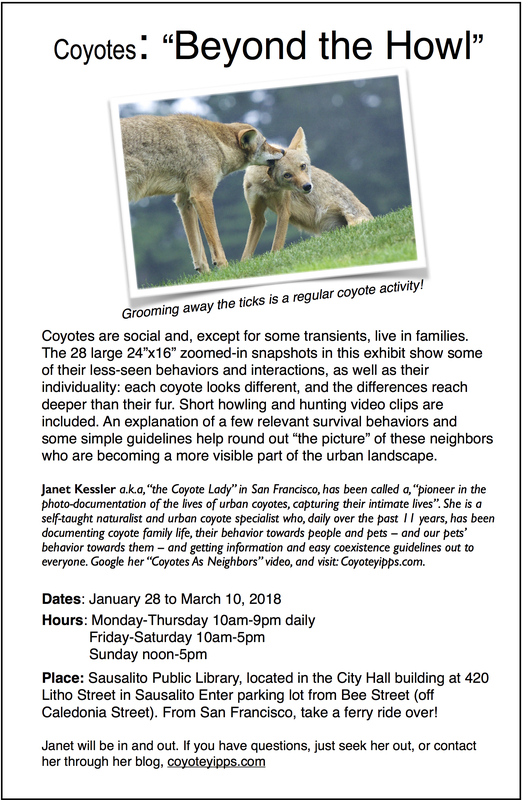 In case you might have a burning interest to know more about coyotes, visit my exhibit which is going up next Sunday at the Sausalito Library and will run for 6 weeks! It’s more of an educational exhibit than anything else, showing some of their constant interactions. The more people understand how social they are, the easier it will be to accept and even embrace them. Coyotes are social and, except for some transients, live in families. 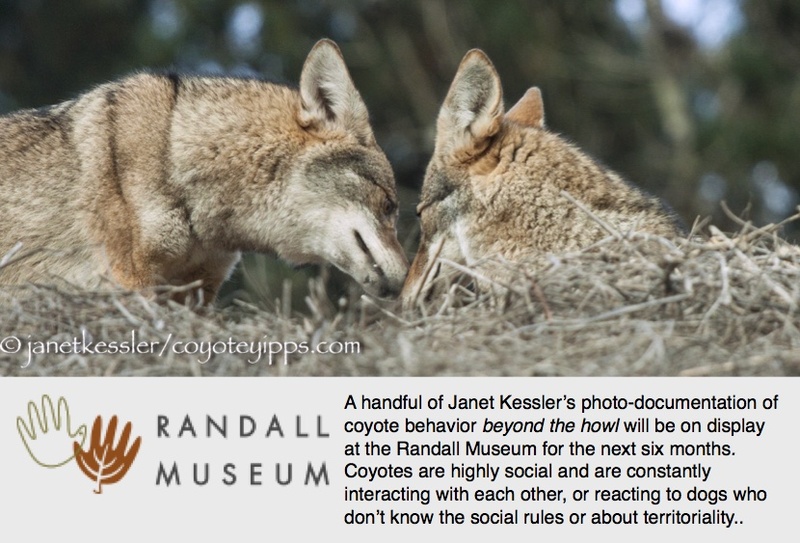 The 28 large 24”x16” zoomed-in snapshots in this exhibit show some of their less-seen behaviors and interactions, as well as their individuality: each coyote looks different, and the differences reach deeper than their fur. Short howling and hunting video clips are included. An explanation of a few relevant survival behaviors and some simple guidelines help round out “the picture” of these neighbors who are becoming a more visible part of the urban landscape. Place: Sausalito Public Library, located in the City Hall building at 420 Litho Street in Sausalito Enter parking lot from Bee Street (off Caledonia Street). From San Francisco, take a ferry ride over! On Installation Day: Our team of three had fun installing the exhibit in the very charming Sausalito Library: we had the layout mapped out beforehand, so only minor logistical adjustments to our plan were necessary. We were rewarded with “ooohs” and “aaahs” from the library staff and visitors from Connecticut, and then from the first official early-bird visitors. We finished a little after opening hours and went off for a reward meal overlooking the bay, which we suggest as something to add to your visit.